Dr Farooq Abdullah, Vikramaditya Singh, Raman Bhalla, Ch Lal Singh, Khalid Jehangir, Prof Bhim Singh and Tilak Raj Bhagat filing their nomination papers on Monday. 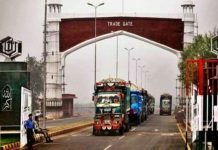 JAMMU/SRINAGAR, Mar 25: Though a record number of 37 candidates have joined fray for prestigious Jammu-Poonch Lok Sabha seat where nominations closed this evening and four candidates filing papers for Udhampur-Doda constituency on penultimate day today, the fight is gradually turning out to be between BJP sitting MPs versus ‘Mahagathbandhan’, unofficially floated by the Congress, National Conference and People’s Democratic Party (PDP) to thwart BJP’s halt to victory for second time. 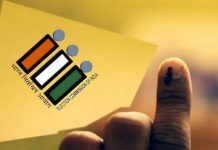 Returning Officer for Jammu-Poonch Lok Sabha seat, Ramesh Kumar (Deputy Commissioner, Jammu) told the Excelsior that 35 candidates filed nomination papers today, taking total number of nominations to 37. 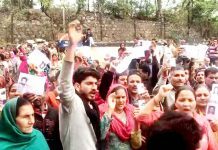 Returning Officer Kathua, Rohit Khajuria said three candidates joined the fray today taking total number to four on Udhampur-Doda seat, where tomorrow is last date of filing papers. National Conference (NC) president Dr Farooq Abdullah today filed his nomination papers from Srinagar Parliamentary constituency at Deputy Commissioner’s office in Srinagar. 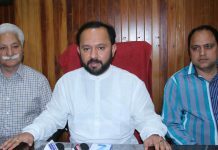 Returning Officer for Baramulla Parliamentary Constituency, Dr G N Itoo today said that 10 nominations were filed on the last date of filing nominations for the upcoming Lok Sabha elections, taking total nominations to 14. While BJP’s sitting MPs from Udhampur and Jammu seats, Dr Jitendra Singh and Jugal Kishore Sharma have already filed their nomination papers, the Congress candidates including Vikramaditya Singh and Raman Bhalla joined the electoral battle today on the two seats. BJP rebel and Dogra Swabhiman Sangthan (DSS) chairman, Choudhary Lal Singh and Panthers Party supremo Bhim Singh too joined the fray for Jammu Parliamentary seat today while Lal Singh and Panthers Party leader Harshdev Singh will file papers for Udhampur seat tomorrow. Though many bigwigs have joined the race for two seats of Jammu region, political observers were of the view that it could be a straight contest between BJP and Congress candidates, backed by National Conference and PDP on both the seats. “The BJP has been a dominant force in Jammu region having won both Lok Sabha and 25 out of 37 Assembly seats in 2014 elections. However, with Congress unofficially floating ‘Mahagathbandhan’ with National Conference and PDP to avoid split of votes of one particular community, the battle has become interesting, though the NC had also backed the Congress on both Parliamentary seats in 2014 polls,’’ they said. However, the political observers were of the view that support of NC and PDP, which were by and large Kashmir-centric parties, to the Congress, which has high stakes in the current elections as it was trying to revive the ground lost to the BJP in 2014, could lead to polarization of votes, which has the potential of badly damaging prospectus of the Congress on both seats. Pointing out that similar type of ‘Mahagathbandhan’ was floated by the NC, PDP and Congress for a day on November 21 last year to form the coalition Government in the State, the political observers pointed out that it was opposed by a senior Congress leader and had collapsed the very next day after Governor Satya Pal Malik dissolved the Assembly. “NC and PDP have nothing in common. They have not formed any kind of agenda with the Congress. Even NC leaders have been openly saying that their alliance was confined to Parliament polls and will not be repeated in the Assembly elections. 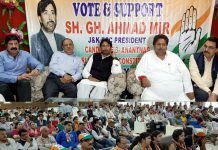 One of the senior NC leader and party’s candidate for Baramulla seat, Mohammad Akbar Lone has described Congress as more dangerous than BJP. The two Kashmir parties have just united in favour of Congress to avoid split of votes of particular community and to defeat the BJP. However, this is not working and could boomerang on the Congress as it might lead to complete polarization, ultimately benefitting the BJP,’’ the observers said. In Udhampur-Doda Parliamentary seat, where tomorrow is last date for filing of nomination papers, a total of four candidates have joined the fray so far. While Union Minister of State in PMO, Dr Jitendra Singh had filed nomination papers on Friday, Congress leader, Vikramaditya Singh son of erstwhile ruler of the State, Dr Karan Singh filed his papers today before Returning Officer, Rohit Khajuria. BSP’s Tilak Raj Bhagat, retired Chief Engineer and an Independent candidate Mohammad Ayub also filed their nomination papers for the seat today. Choudhary Lal Singh and Harshdev Singh were expected to file papers for Udhampur-Doda constituency tomorrow. In Jammu-Poonch Lok Sabha seat, BJP candidate Jugal Kishore Sharma had filed his papers on Friday while his Congress rival, Raman Bhalla submitted nomination papers to the Returning Officer today. Former Minister and BJP rebel, Choudhary Lal Singh, who had floated Dogra Swabhiman Sangthan, National Panthers Party supremo, Prof Bhim Singh and BSP candidate Badri Nath also filed their papers for Jammu constituency today. 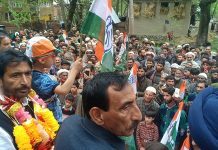 Dr Jitendra Singh had defeated Congress-NC joint candidate, Ghulam Nabi Azad, presently Leader of Opposition in Rajya Sabha, in 2014 Parliamentary poll on Udhampur-Doda seat with a margin of over 62,000 votes while Jugal Kishore Sharma had won Jammu seat with over 2.5 lakh votes defeating two-time MP and Congress veteran Madan Lal Sharma, who was also backed by the National Conference. The BJP has repeated both its candidates on Udhampur and Jammu seats while the Congress has changed its nominees. This time, Vikramaditya Singh has replaced Azad and Raman Bhalla, former Minister and two-time MLA from Gandhi Nagar has taken the place of Madan Lal Sharma. Jammu seat will go to polls on April 11 and Udhampur on April 18. Speaking to reporters after filing nomination papers in Srinagar, Dr Abdullah said that struggle of his party is against communal forces. “I am still young and a lot of work is still to be done for this State and the country as well. We have to save our country from the communal forces. Our struggle is against the communal forces”, he said. Abdullah, who was accompanied by vice president NC Omar Abdullah and General Secretary Ali Mohammad Sagar, at the DC office when he filed papers for Srinagar-Budgam Parliamentary seat which is going to polls on April 18. People’s Democratic Party (PDP) has fielded Aga Mohsin from Srinagar constituency while Congress has decided to left Srinagar seat for Dr Abdullah as part of their seat sharing agreement. 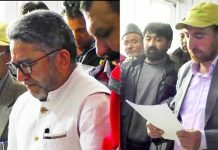 Khalid Jehangir of BJP and Nazir Ahmad Lone of Rashtriya Jan Kranti Party also filed their nominations from Srinagar constituency today. Tomorrow is the last date for filing nominations for Srinagar constituency. 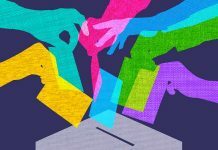 Returning Officer for Baramulla Parliamentary constituency, Dr G N Itoo today said that 10 nominations were filed on the last date of filing nominations for the upcoming Lok Sabha elections. The total number of candidates who have filed their nominations is 14. 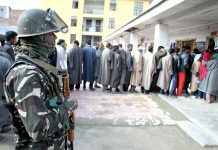 Those who filed their nominations today include Haji Farooq Ahmad Mir of Indian National Congress (INC), Mohammed Maqbool War of Bhartiya Janta Party (BJP), Jahangir Khan of Jammu and Kashmir National Panthers Party (JKNPP), Syed Najeeb Shah Naqvi, Abdul Rasheed Shaheen, Javeed Ahmad Qureshi, Abdul Rasheed Shiekh, Syed Muzaffar Ali, Mohammad Abdullah Chatwal and Abdul Majeed Bhat as Independent candidates. 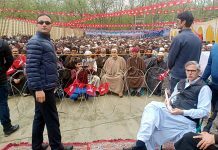 Earlier Raja Aijaz Ali as Independent, Abdul Quyoom Wani of People’s Democratic Party (PDP), Mohammad Akbar Lone of National Conference (NC) and an Independent candidate Syed Aamir Sohail had filed their nominations. Tomorrow is the scrutiny of the nomination papers and for the first phase, the polling is scheduled to be held on April 11. Meanwhile, an official handout said. 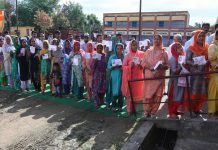 35 candidates today filed their nominations for Jammu Parliamentary constituency before Returning Officer Ramesh Kumar (Deputy Commissioner Jammu). A total of 37 candidates were now in fray. 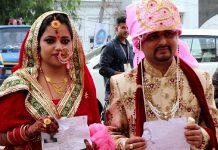 Those who filed their nominations today included Badrinath of BSP, Mohd Younis of JK Peer Panjal Awami Party, Susheel Kumar Hindustan of Nirman Dal, Javaid Ahmed of All India Forward Bloc, Naresh Kumar Talla of Jai Prakash Janta Dal National Party, Raman Bhalla of INC, Gursagar Singh of Navarang Congress Party, Talib Hussain of Rashtriya Lok Dal, Prof. Bhim Singh of JK National Panthers Party, Lal Singh of Dogra Swabhiman Sangathan Party, Kanta Andotra of Dogra Swabhiman Sangathan Party, Vicky Kumar Dogra of Janta Dal United and Shazbad Shabnam, Perseen Singh, Gulam Mustafa Chowdhary, Satish Poonchi, Tej Ram Dogra, Bahadur, Javed Iqbal Rishi, Manish Sahni, Sakander Ahmad Nourani, Tarsem Lal Khullar, Mansoor Ahmed Khan, Balwan Singh, Kabir Hussain, Syed Zeshan Haider, Anil Singh, Surjeet Singh, Ajay Kumar, Suresh Kumar, Jasvir Singh, Labha Ram and Mohd Rahoof as Independents. Jugal Kishore of BJP and Syed Aqib Hussain Independent people’s party filed their second nomination from Jammu Poonch Parliamentary constituency today on the last day of nominations. Earlier Jugal Kishore of BJP, Aqib Hussain Independent people’s party, Rajiv Chuni and Subhash Chander have filed their nominations. The scrutiny of papers will be held on March 26 and the last date of withdrawal of candidature is March 28 up to 3 PM. The polling will be held on April 11.